“An Igbo man sees the entire world as his village, while an Hausa man sees Kano as the universe and a Yoruba man sees Lagos as his entire world. Nigeria is just too small to contain the Igbo man’s dreams, aspirations, industry, commerce and expertise. He needs a platform to rule and dominate the entire universe which is Biafra. He does not really need oil to survive since he does not work in the civil service, public service, or does he constitute the majority of politicians or government contractors but earnestly needs FREEDOM to control his destiny. His dominion is in the area of invention, creativity, industry, development, commerce and the provision of goods and services for the benefit of mankind and not religious, cultural or political dominion. He has capacity to drive the world technologically like the US, UK, Russia, France, Germany, China and Israel. An average Igbo man is far better than an average Yoruba or an average Hausa-Fulani; intellectually, economically and industrially, notwithstanding his money that Awolowo stole to develop and empower Yoruba land, or his properties that Gowon destroyed and others he gifted out. He carries the blessing of Abraham and Nigeria will remain cursed as she continues to curse and undermine him. The only way Nigeria will see light is by blessing and letting Biafra Go. The blood of the Igbo men slaughtered by Hausa- Fulani, the blood of the pregnant Igbo woman, whose womb was slit open to kill her and the unborn child by Hausa-Fulani, and the cry of the Igbo child starved to death by Yoruba, will continue to chastise the Nigeria project. Nigeria is doomed and under a curse, and therefore needs to make atonement, restitution and seek forgiveness from the Igbo man. Hausa, Fulani and Yoruba should bury their faces in shame. How would you explain why an entirely military affair as regards the 1966 coup d’etat led to the slaughtering of millions of Igbos in Northern Nigeria? What about the massacre of the Igbos in the bloody riots of Jos and Kano in 1945 and 1953 respectively in Northern Nigeria and a good number of Igbos slaughtered ever since then, now crowned it with the Boko Haram insurgency and the Muslim foot soldiers masquerading as Fulani herdsmen. The plotters of the 1966 coup d’etat were not all Igbos. Even at that, Nzeogwu did not consult his kiths and kins before embarking on the ill-fated coup? Why should an ordinary Igbo man pay for what was clearly a military rebellion? Several officers of Northern origin took part in Nigeria’s first military coup d’etat. The “Igbo coup” tag attached to the assault defeats the fact that scores of Northern officers took part in the Lagos operations, and even assisted Nzeogwu when he stormed the residence of the Northern Region’s premier; Ahmadu Bello. Nzeogwu was later to describe the detachment of troops accompanying him to Bello’s house as “a truly Nigerian gathering” (New Nigerian – 18th January 1966). Nzeogwu pointed out that the Northern soldiers accompanying him “had the chance to drop out, more than that, they had bullets, they had been issued with bullets but I was unarmed. If they disagreed they could have shot me….most of the other ranks were Northerners but they followed”. Among the prominent Northern soldiers that helped Nzeogwu to overthrow the Northern Region’s government was John Atom Kpera. Kpera later became the military governor of Benue State. Many of the soldiers that accompanied Major Ifeajuna when he abducted the Prime Minister; Tafawa Balewa, were also Northerners. As much as Hausa, Fulani and Yoruba, notwithstanding their heavy grip on Nigeria resources, civil service, public service, politics and government contracts, decide to remain backwards, being held back by their religion and culture, as much as the Igbo man continues to progress Abrahamically, fearlessly propelled by his culture and strengthened by repression and harsh antagonistic economic policies by Nigerian government, the hatred, jealousy and envy towards an Igbo man will have no bound. The Federal Character Policy – that allows mediocre to insult the talented and skilful, and the Educational Less Disadvantaged States policy – that allows Dullard to sit in class with the exceptionally gifted – are wrongly misapplied as an anti-Igbo policy and have ironically brought the beneficiaries further down and the Igbo man further ahead. How would you explain why 55 years of independence and operation of these policies some tribes still join the civil service, public service and politics with primary school certificates to debate and reason with professors and PhD holders from other tribes like the great Igbo tribe? Nnamdi Azikiwe joined politics with Ph.D, while Emeka Ojukwu and Chukwuma Nzeogwu joined the Army with Msc and Bsc respectively. What zoo is worse than a country where the ill-educated and mal-informed, control the affairs of the well-educated and well-informed, where the non-talented and non-gifted control the affairs of the gifted and talented. The Igbo man is caged in Nigeria and unequally yoked with his neighbours, and desperately needs freedom? The Igbo man is dominating the entire world and has left Nigeria behind long ago. He is an all-round global player and seeks international jobs and offers across the world in the global contest, like in the United Nations organisations, the World Bank, the IMF, the Commonwealth and recently Heads the hallowed chamber of International Criminal Court in the Hague, where he is appreciated and appraised. He is just not in tiny Lagos or Abuja, Kano, Kaduna and others. He is in every country of the world where he feels safe, secure and free, even in Arab nations, but never in Nigeria. You cannot hold an Igbo man down to catch up with him. Nnamdi Azikiwe was born in Zungeru in Niger State in 1904, so when did his father settle in the North? Emeka Ojukwu was also born in Zungeru in 1933. Chukwuma Nzeogwu was born in Kaduna in 1937. The Igbo have cohabited with the Hausa, Fulani and Yoruba, for hundreds of years in their own land, yet he remains an easy prey for slaughter due to envy and jealousy. He is more Nigerian than every other Nigerian. He built Lagos, Kano, Kaduna, Port Harcourt, Abuja, etc because he is development-minded and sees the world, not just Nigeria, as his village, hence, the reason he is hated, envied and killed. 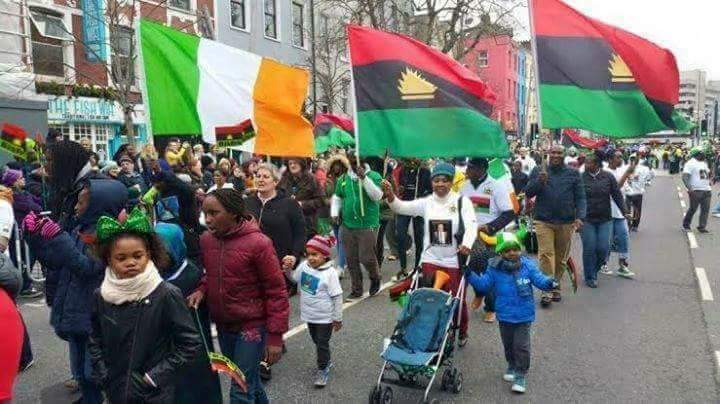 He needs Biafra so he could bring light, not just in Nigeria, but in the entire African continent, and free Africa from mental slavery that has ravaged her beyond repair.